THE AMOUNT OF MONEY I MADE AT THE CRAFT FAIR!!! Can you believe it? $1089.00!!! I sold pretty much everything I had - hence the reason I am making 10 sets of coasters right now (people loved them!!) and will be making cards all week... 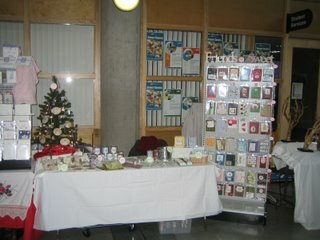 I thought that I made enough for all four of my craft fairs - boy was I wrong! That is great..it is too bad that you will be really busy all week to prepare for the next one. But think about all the money you will get from the 4 fairs. Wish I could tour one but alas I am in snowy Calgary. I can't wait to see you at the fair - I'm planning to come up for the college heights one. I will probably be up this week - my grandma doesn't look like she will make the weekend right now and I will need to pick up my sister at the airport. Maybe we can get together for coffee... I will see how it goes. I'll call ahead.